These were the scotch eggs I made for the picnic and bike ride I went on the other weekend. When I talked about them on Twitter there was some demand for a blog post so here it is! Scotch eggs are one of those things that give high reward for little effort. Despite being very easy to make they are impressive and incredibly good to eat – so much better than anything you can buy in the shops, with the added advantage of containing fresh ingredients and nothing else. What’s more, you can eat them freshly cooked while they’re still warm and lovely and crispy on the outside; much my preferred way of eating them, as lovely as they are cold. All you need to do is hard boil some eggs but, and here’s the trick for the perfect scotch egg, make sure they aren’t completely hard in the middle but at that almost-hard stage; about 7 minutes should do it for large eggs. 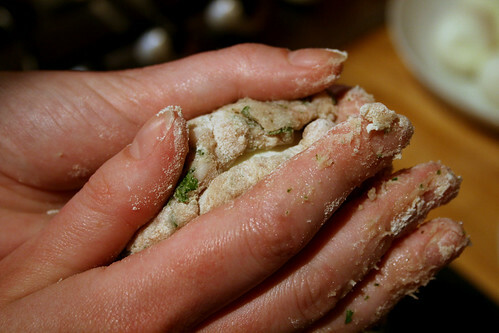 Then you just wrap them in good quality, seasoned sausage meat – herbs mixed in if you like – dip them in a beaten egg and then breadcrumbs and fry them until they’re crisp and golden and the sausage meat cooked through. I’m right in the middle of testing recipes for my cookbook at the moment and shall be perfecting this recipe for inclusion, so you’ll be able to read the full recipe when it’s published next spring. 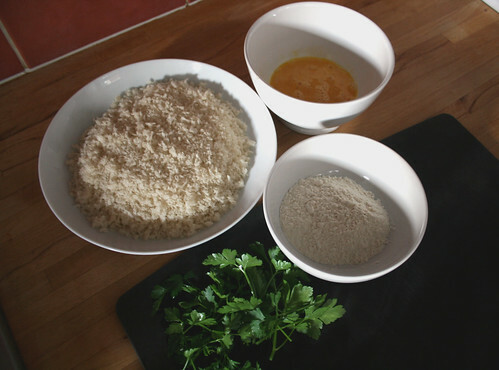 In the meantime, here are some photographs of the steps to make scotch eggs. Those look delicious! Glad you did a post about them. Interesting…I'd never heard of Scotch Eggs. They sound wonderful! My daughter in law, who is from Plymouth, England, tried to tell me what scotch eggs were. Now I see what she was talking about. Thanks for the visuals. 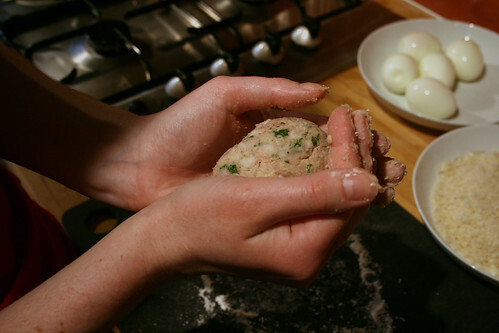 I was so thrilled to see a recipe for Scotch Eggs, as I was just talking to my co-worked about them the other day! I love them, although I was introduced to them in the most unlikely of places! They were often served in the dormitory cafeteria when when I was studying abroad in Tokyo! I'm pleased to have enlightened some of you! Goodshoeday – I've done both and they both work just as well. The important thing is to have the temperature hot but not so hot that they just brown on the outside and not cook on the inside. 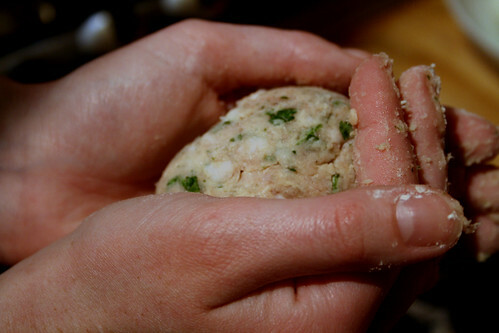 Test with a bread crumb – it should go golden in about 30-60 seconds. I just keep coming across more and more wonderful ways to have eggs. This one is at the top of my list! Thanks for sharing. This post is great, as well! Thanks for sharing these great recipes with us! But do you serve it with mustard or ketchup?! I guess there are so many possible varieties too, using different eggs/meat/herbs and spices, etc. fantastic! living in France, scotch eggs are impossible to come by, so i will definitely be trying this – thanks so much for the instructions and piccies! Scotch eggs with tomato sauce and other spices!! yummm…it will be ideal for a tea party with friends. A spicy scotch eggs to go with spicy gossips. thank you for shearing your post. as simple as you make it out to be, scotch eggs were a total novelty/ question mark to me when I first came to London. loved those cute little balls of crispy coating, seasoned mince, and that egg hiding inside like a treasure! 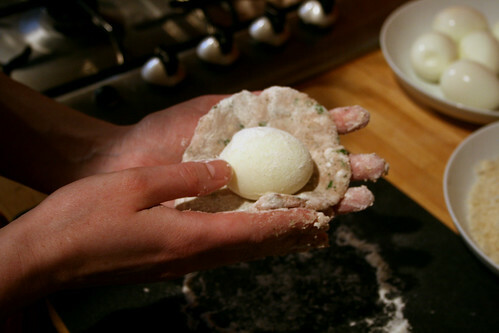 If you place the sausage meat between cling film and press it flat, then roll the egg up, it keeps your hands clean! 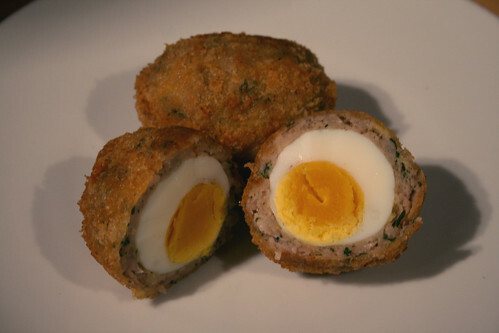 Also, I now cook my scotch eggs in the oven – 180C fan for 20-25 mins for a “slightly” healthier option.